Dogs love socialising with other dogs and humans. Our daycare provides these interactions under the care of our experienced handlers. All our furry guests are pre-assessed before joining the group. 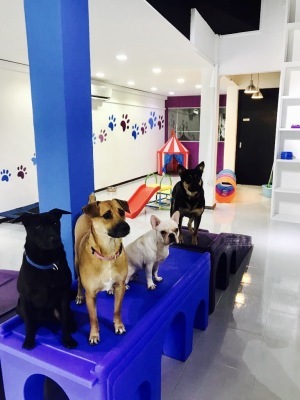 Our playroom is designed for canine fun, ensuring your pooches mind and body are excercised and you take home a happy dog. Book your first free trial now! Refer a friend and receive a FREE day of daycare for your dog. Boarding is also offered. Please contact shop directly. 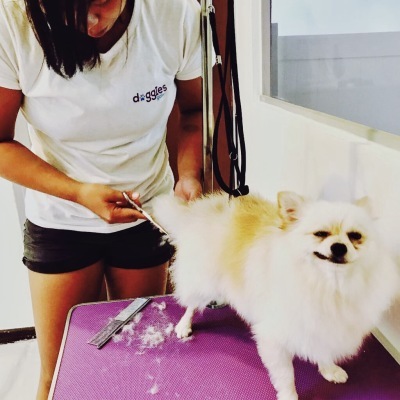 As trained and fully experienced pet groomers we understand dogs can become stressed when receiving treatments in a new environment. That’s why we ensure every pet receives the attention it deserves to make the treatments an enjoyable experience. Copyright © 2017 Doggies Galore. All Rights Reserved.